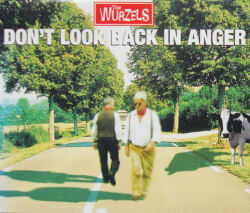 Following the Oasis tribute to The Wurzels - the smash album (What's The Story?) Morning Glory, named after one of The Wurzels' best loved songs - the Wurzels decided to return the compliment by recording one of Oasis' biggest 1990s hits Don't Look Back In Anger as a tribute to their favourite Manchester band. 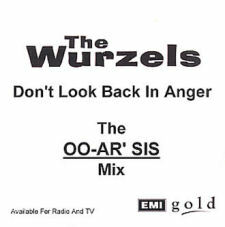 A straight cover lyrically, but definitely not musically, being performed in The Wurzels' inimitable style, the record reached the UK Top 60 during its first week of release, but surprisingly failed to crack the all-important Top 40 despite plenty of airplay and interest from the media. 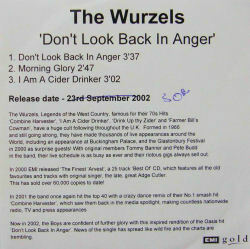 The other two tracks were the original 1970s versions of two of the Wurzels' best-loved songs, including that old Wurzels favourite that did so much to inspire Noel and Liam to such musical heights, two decades later. There was also an official EMI Gold UK 1-track CD-R review copy of the release which was issued exclusively to reviewers and radio stations. It had a custom printed sleeve (pictured below) and titled disc. 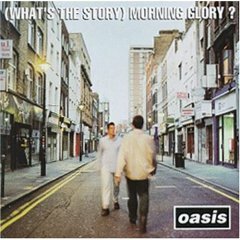 Artwork from the Oasis album (What's the Story) Morning Glory released in 17 Feb 2000. Look familiar? They're back and in full form for 2002. 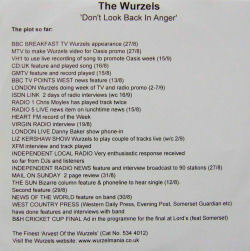 Those Zummerzet Zider' Ead's The Wurzels look to storm the charts once again with this Oasis cover. Before I heard the title track I though they would of changed the lyrics, or at least "wurzeled" 'em up a little. 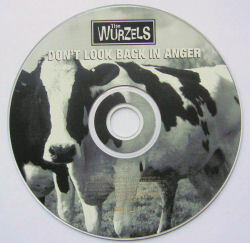 It's a bit of a disappointment as a true Wurzels fan to hear just the boring old Gallagher lyrics. Apart from the Lyrics the whole song has had a makeover. It starts of "Oasis" style then throws you straight into a proper old Wurzel tune. A good effort from the lads. 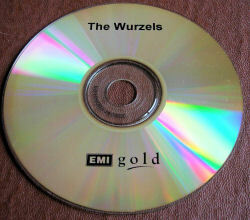 The two other tracks are true Wurzels classics, and are sung at many pubs across Zummerzet on a Friday and Saturday night. Morning Glory is an inspired choice, considering the Oasis album that Don't Look Back in Anger come from, proof that the lads 'avn't lost their sense of humour. 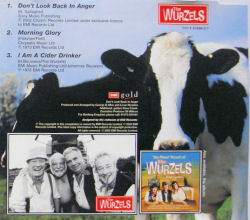 Remember - Wurzels Music is meant to be Fun, they have never wanted it to be anything else!